You know the importance of optimizing the placement of your stereo speakers…but do you know how to actually evaluate that placement? You know how beneficial a good burn-in and demagnetization can be…but did you know that in less than half an hour, you can improve not just your stereo but your hearing too? Only with USHER! 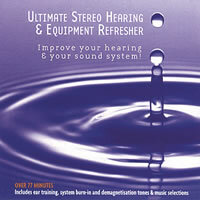 With this one CD, you’ll get a unique program for rapid improvements in the acuity of your hearing, simple tracks for evaluating your stereo’s imaging and special burn-in analysis and demagnetization signals. And there’s some great music to round it all out. USHER in a new dawn of listening pleasure.